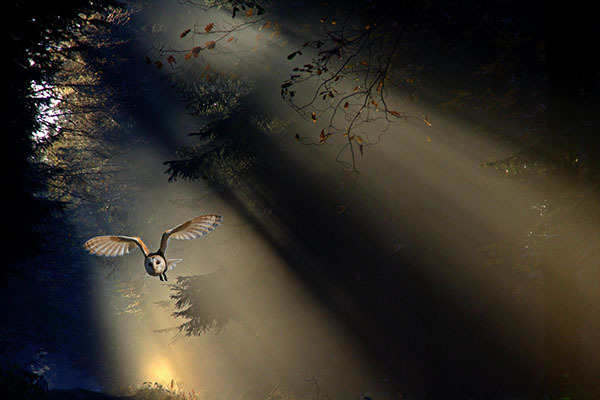 Owls hunt prey in the hours of darkness. It may be part of the reason they have become a universal symbol for spookiness. With their piercing stares, heads that turn almost 360 degrees and nocturnal lives, owls have become a universal symbol for spookiness. A hoot is often the only hint you’ll have that an owl is near, which can make their covert presence even scarier. And, in the dark, they hunt prey. Across most of the Lower 48 and in a few parts of southern Canada (as well as in much of the rest of the world), barn owls live in open habitats, including agricultural and brushy fields, deserts, grasslands, marshes, ranchlands, strips of forest, woodlots, and sometimes cities and suburbs. They nest in caves, tree cavities and buildings. Barn owls are generally most active at dusk and dawn. Their diets consist mainly of small mammals, such as bats, common shrews, field voles, lemmings, mice, rabbits and rats. If hunting is good, they’ll typically eat three or four prey items a night. During the breeding season, a pair of barn owls will ideally find this amount for each owlet, as well; which means that to feed two adults and their offspring, almost 4,000 prey animals a year are required. But barn owls’ success in finding that much prey varies. Sometimes they are unable to hunt due to unfavorable weather conditions, such as heavy rain, strong winds or deep snow. While barn owls have the extraordinary ability to fly silently, that hunting advantage is counterbalanced by other factors. For example, their specially adapted feathers are not particularly waterproof, and they are unable to store a lot of body fat. This means that they are unable to hunt in downpours and are particularly prone to starvation during prolonged periods of severe weather or prey shortage. In the winter, to save energy—both by reducing activity and by minimizing the significant heat loss that can occur when flying in cold air—barn owls will often hunt from posts or other suitable perching places. The concavity of a barn owl’s facial disk works like a satellite dish that collects sound waves and directs them toward the owl’s ears. 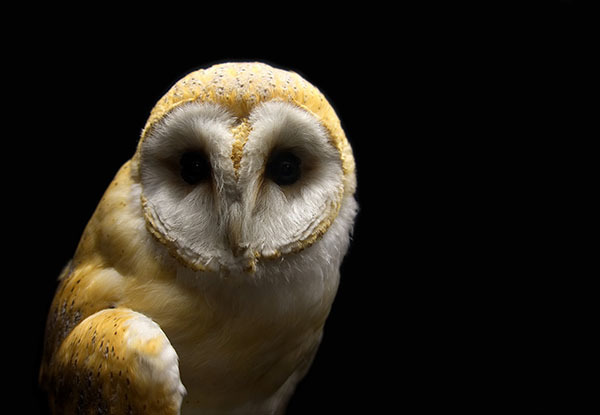 Because barn owls are nocturnal and secretive, their population sizes are hard to estimate. We know that the birds are threatened, though, by the conversion of agricultural land to urban and suburban development. This means not only the loss of suitable nesting sites for the owls, such as large, hollow trees and old buildings, but also the loss of habitats for their prey. 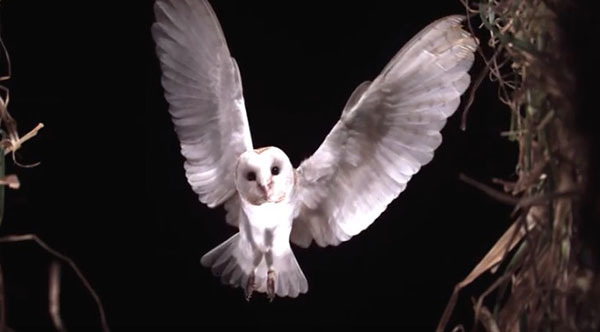 Barn owls were affected by the use of DDT-related pesticides before the nationwide ban in 1972; and today the birds may be susceptible to poisons that are used against rodents, since they form a large part of the owls’ diets. And because they hunt by flying low over fields, barn owls are often hit by cars. Planting hedgerows alongside roads can help prevent this, and nesting boxes (of the correct size) have helped populations of barn owls recover in areas where natural nesting sites became scarce. When a barn owl does manage to strike, though, it is a moment of—some would say—“terrifying” beauty. The owl starts with a headfirst dive before pulling its head back and replacing its front-first facial disk with outstretched talons. 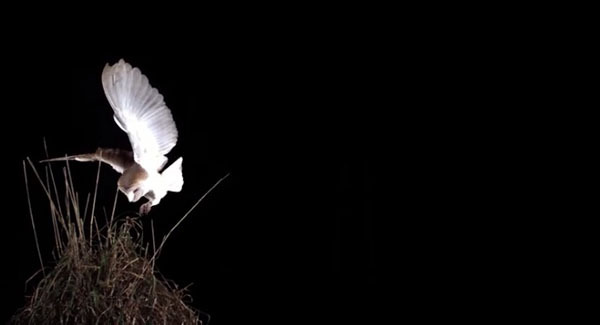 This amazing sequence is depicted in the BBC, slow-motion video of a barn owl pouncing into long grass that is shown below. I will forewarn you, though: this particular hunter of the night is successful. She snatches her prey out of the darkness—and eats it.